Good preschool education helps get kids from poor families ready for school proper and do better in standardised tests, but it is expensive. Average preschool per capita spending in the US in 2017 was about $5,000 (Rs.3.5 lakh), a drop in real terms compared with 2002. Seven states had no government programme at all. Early childhood education and care is attracting a surge of interest in most rich countries. Increasingly, it is moving out of the home and into institutions, a process experts inelegantly described as “defamilisation”. Across the OECD, average enrolment of three-five-year-olds rose from 75 percent in 2005 to 85 percent in 2016. One reason is to make it easier for women to go out to work, which boosts GDP and saves the state money in family support. In some countries, this has been an explicit policy objective. Britain, for example, some years ago introduced free child care for 15 hours a week, and of 30 hours a week provided both parents work, for all three and four-year-olds, regardless of background. Denmark, along with other Nordic countries, had the debate about institutional care for young children 40 years ago and decided to make it universal, says Charlotte Ringsmose, who teaches pedagogy at Aarhus University. Attendance at preschool centres and kindergartens among three to six-year-olds is around 98 percent. Danish child-care centres focus on play rather than formal tuition. Children do not learn to read until they start school proper at six, but then catch up fast. And Danes don’t shop around for early-years child care because the nearest state-run place is usually just fine. Kids from the least well-off families go free, and even those with richer parents are heavily subsidised. Perhaps not coincidentally, both fertility rates and female labour-market-participation rates in Denmark and other Scandinavian countries — which have similar arrangements — are above the European average. Recent advances in neurology and child psychology have shown that the period from birth to age five, when the brain is at its most plastic, is crucial in a child’s development, and that interventions during this period can be much more effective than later ones. Children from prosperous, educated backgrounds start off with a huge advantage because they already get a lot of stimulation and informal learning at home. But institutional early education and care, if done right, can help level the playing field for those from less privileged backgrounds. 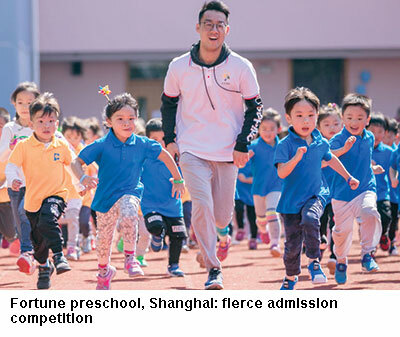 Fortune is considered one of the best kindergartens in Shanghai. It is a private establishment with capacity for 3,000 children aged from 18 months to six years, scattered among various campuses across the city. Competition to get in is fierce. Local parents are subsidised by the government, but for others, fees for the most expensive package can run to 15,000 yuan (Rs.1.57 lakh) per month. That buys you bilingual, bicultural teaching in Mandarin and English and even includes philosophy classes for five-six-year-olds, explains Stephen Walshe, Fortune’s Irish co-principal. Most important, though, it offers a head start in a highly competitive system leading from kindergarten to primary, middle and senior school and eventually on to university. Better-off mothers often stop work temporarily to make sure their child reaches that vital first rung on the educational ladder. For ambitious Chinese parents, formal learning cannot start soon enough.